Runner Kaitlyn Kramer has been part of exciting moments during her athletics career at NC State. In October, the Wolfpack women’s cross country team captured the Atlantic Coast Conference title as the host team at WakeMed Soccer Park in Cary – improving a spot over its 2015 finish. For the second year, Kramer earned all-ACC honors. Then in November, NC State finished fourth at the NCAA Championships in Terre Haute, Indiana – again, a one-position improvement over 2015. That season, Kramer’s finish in the race had secured NC State’s first top-five appearance since 2001; she beat Michigan’s sixth runner by nine seconds and 14 places to serve as the team-standings tiebreaker. But, stride for stride, the student portion of Kramer’s student-athlete experience at NC State has been extraordinary, too. It has encompassed a double major, hands-on learning and a life-changing summer internship. Kramer graduated last May with degrees in chemical and textile engineering – and with a perfect 4.0 grade-point average. For the second year, she achieved CoSIDA Academic All-District team honors in recognition of her outstanding accomplishments in competition and in the classroom. The ACC selected Kramer, a member of NC State’s Omega Chi Epsilon and Tau Beta Pi honor societies, as its Women’s Scholar Athlete of the Year and as one of several winners of $5,000 postgraduate scholarships. Recipients, the conference noted, performed with distinction in both the classroom and their respective sport, while demonstrating exemplary conduct in the community. Now pursuing her master’s degree in textile engineering, Kramer is finishing her final year of competing for NC State, with the indoor track season currently under way and outdoor competition starting in mid-March. Injuries slowed her Wolfpack career at times, including an entire year that she sat out with a medical redshirt, but she has been a solid performer in cross country and indoor and outdoor track for a top-level program. When Kramer was preparing to graduate from Ardrey Kell High School in Charlotte – a three-time all-state cross country runner and eight-time conference champion – several athletics programs recruited her. She quickly favored NC State’s coaches. She was uncertain, however, about her college major. Engineering had not really been on her radar. A discussion with Brian Koehler, director of student engagement in the College of Engineering’s Office of Academic Affairs, during a campus recruiting visit convinced Kramer that it might be her calling. “I ended up choosing NC State because it was the only school recruiting me that offered engineering,” she said. It proved to be the correct choice. 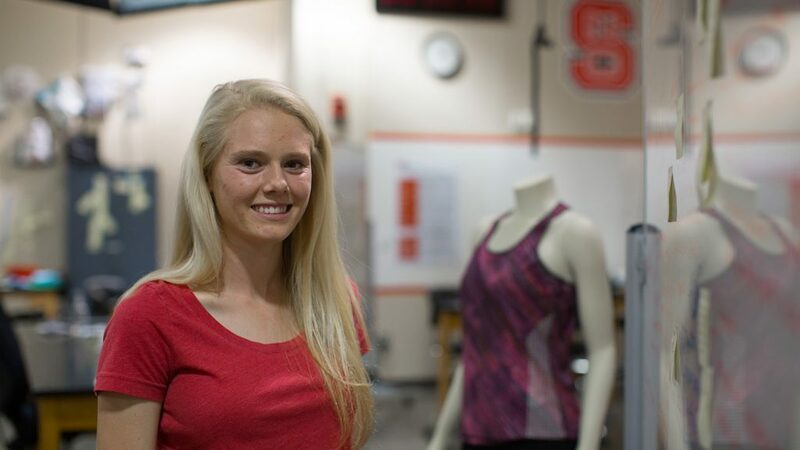 Real-world educational opportunities such as her senior design project, which became a valuable highlight of her NC State experience, led Kramer to develop an interest in technical textile products. Senior Design is a yearlong capstone course. In the fall, students receive open-ended industrial or research problems from project sponsors that call on them to use both academic knowledge and the ability to think beyond the classroom. Projects address needs, concept ideation, prototyping and evaluation. During judging last April, Kramer’s team earned second-place honors for creativity in design. The experience helped Kramer develop skills required to work well in a small team while providing the important chance to work with a real company. Kramer and her two partners completed a project for Hanesbrands Inc. related to reflective garment design and analysis – responding to the challenge that most traffic fatalities involving runners, bikers and other pedestrians occur in the dark or during dawn or dusk. The team worked on making clothing more visible, taking into consideration safety, cost, visual appeal and other factors. “My chemical engineering degree gave me a lot of useful knowledge and my textile engineering degree gave me a way to apply it to clothing,” Kramer said. Over the summer, she completed an internship at Gore’s fabrics division in Elkton, Maryland. Kramer worked on a test method to evaluate new rain jacket fabrics that are under development. Once she completes her master’s, Kramer may pursue a career as a professional triathlete before starting work as an engineer. She would love to end up at a company such as Gore – creating the very fabrics that she might wear as an athlete.